The customer had already purchased some beautiful items and needed some help pulling them all together. She had acquired a decorative scroll hanging that she had hung over the bed, and rather than take it down we decided I should paint around it and that it should become part of the design. The result was a unique three dimensional edge to my decorative cartouche. Elegant Rose vines grace many corners of the room as well as around the cartouche. my personal decorating style for nurseries is sweet, peaceful, and dreamy. My favorite item is the christening dress hanging in the corner behind the chair. Why keep beautiful dresses in the closet? Love this pretty room. So soft and lovely! Don’t you just love that decorative scroll? Is it made of wood? And yes, that christening dress is absolutely beautiful! You are right, why keep beautiful dresses in the closet? thanks everyone. this is one of my client’s nurseries. I painted the artwork. The is half real and half painted. The top piece is the fake part and it is made of some sort of paper mache’ material. Michelle Waldron graduated with honors from Boston University's School of Fine arts in 1998 with a major in painting and a minor in art history. Owner of Wall Wishes since 2003. 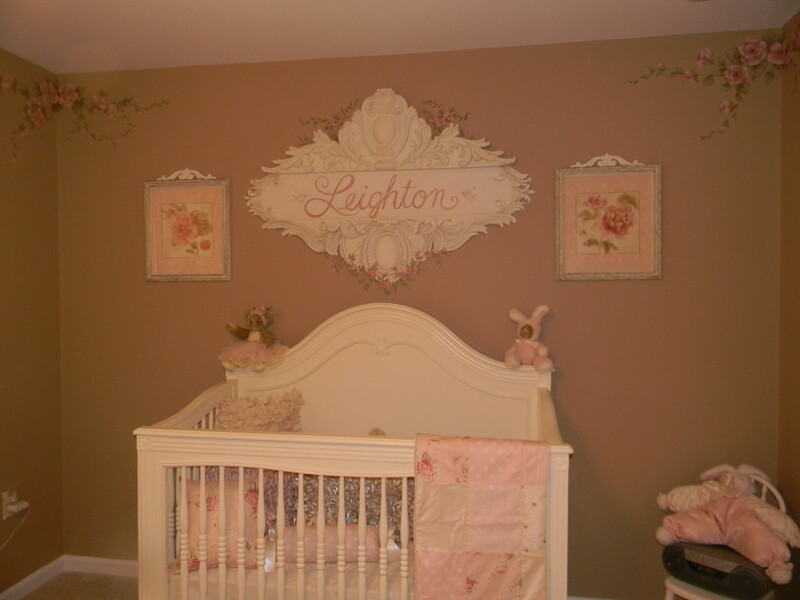 Michelle paints murals, decorative and faux finshes, and specialize in children's rooms and nurseries. Winner of Posh Tots Design Dynamo contest 2011.